Worked Her Dress Or Looked A Mess: The Golden Globes 2011! I have literally been running all over the city lately planning amazing things for the future with OJ&B! I know this is a couple of days late but YOU KNOW I had to give my opinion on the globes gowns! I was actually really pleased with the fashion at this year's Golden Globes. I feel like everyone stepped it up a notch and started caring about how they looked at award shows again. No matter how good everyone looks we all know that there is always going to be a group of people looked like they got dressed in the dark with a stylist that was on some crazy that day. Because of this, I have divided up the gals in two groups: The ones who worked their dress and the ones who looked as mess! Catherine Zeta-Jones is in the running to be my best dressed at the globes in this stunning forest green ballgown Monique Lhuillier. Monique has gorgeous dresses. I loved all of the green on the carpet this year! This is proof that I I don't hate when someone does something right! I am not a huge Eva Longoria fan at all but there is no denying that she looked beyond gorgeous in this Zac Posen dress. Emma Stone got and Easy A in this Calvin Klein situation. I usually do not like the minimal look but she rocked it! I hope she goes back to her red hair soon. Christina Aguilera won me over in her lace and jet beaded Zuhair Murad dress. I love how it hinted to her movie Burlesque. What's This? "A Dress" Says Who? "Calvin Klein!" Claire Danes looked all kinds of good her CK Dress. Calvin was having a major Globes moment. Tilda Swinton looks like a sleepy nightgowned mess in this Jil Sander "dress." 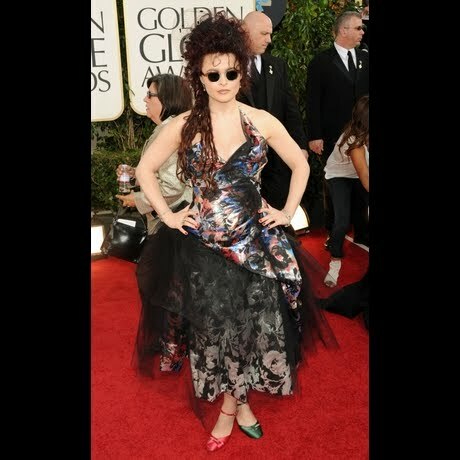 Helena Bonham Carter at the Globes is going to be 2011's most popular Halloween costume! This is a Helenabomination! Natalie Portman in Viktor & Rolf was just bad!! She is usually has such good style! I am going to blame this on the fact that she is a first time mom and did not know how to style her baby bump. Wearing a huge red glitter rose is not the answer EVER! Julianna Margulies may be a Good Wife but this Yves Saint Laurent dress makes her look like a bad dresser. 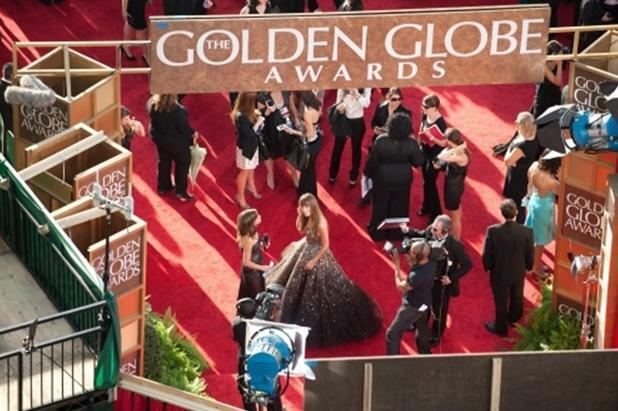 It is too plain and boring for an event like the globes! Give me glam! Heidi Klum's Marc Jacob dress is another example of something that is not glam enough for the globes. This is more People's Choice awards appropriate. So frightening that Helena Bonham Carter even wore different color shoes! Sad to take the moment to shine and splatter it with 4x4 backroad mud. Just sad.